Known for rocking the audience hard in Okinawa City the past eight years, 7th Heaven Koza will be boosting the energy level even higher this week as it celebrates the club’s eighth anniversary with a special party / live music performance. To celebrate, 7th Heaven Koza will host a once in a lifetime, event, a must-see collaboration of two of Japan’s most famous musicians. Globally renowned guitarist, Akira Takasaki and the legendary Okinawan rock keyboardist George Murasaki will make history by taking the same stage Saturday night. 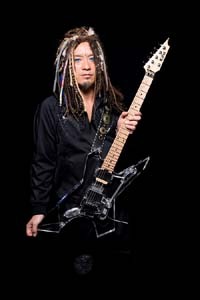 Not only is Akira an iconic guitar god, but he is also the lead guitarist and founding member of the world famous heavy metal band LOUDNESS, which gained acclaim by becoming the first Japanese heavy metal act ever to be signed in the U.S. and placed on the American Billboard top 100. The event, organizers say, promises to be more than music lovers on Okinawa have ever encountered before. Doors at 7th Heaven Koza open at 7 p.m., with bands starting at 8 p.m. Other performers Saturday night will include 8-Ball, 2side1BRAIN, Fake Kingz, Roach, and F.O.D. Advance tickets are $15, or $20 at the door, and are available at 7th Heaven Koza. Call (098)982-1987 or visit www.7thheavenkoza.com for further information.